NEBNext® High-Fidelity 2X PCR Master Mix is the original non-hot start NEBNext formulation of Q5® High-Fidelity DNA Polymerase. This formulation is also included as a component in the original NEBNext standard workflow library prep kits for Illumina, and in NEBNext library prep kits for Ion Torrent. However, the NEBNext Ultra II Q5 Master Mix (NEB #M0544) is now available, and this more recent formulation is a hot start and also further improves the uniformity of amplification of libraries, including superior performance with GC-rich regions. The NEBNext Ultra II Q5 Master Mix is also included as a component in all NEBNext Ultra II kits, for DNA and RNA library preparation. NEBNext High-Fidelity 2X PCR Master Mix is the original non-hot start NEBNext formulation of Q5 DNA Polymerase. This formulation is also included as a component in the original NEBNext standard workflow library prep kits for Illumina, and in NEBNext library prep kits for Ion Torrent. NEBNext High-Fidelity 2X PCR Master Mix contains dNTPs, Mg++ and a proprietary buffer, and requires only the addition of primers and DNA template for robust amplification. Figure 1: Comparative Analysis of Different DNA Polymerases with Known Low Coverage Regions. Indexed libraries were prepared from human IMR90 DNA and split into individual samples for library amplification. Amplification was performed using 8 cycles of PCR with Phusion High-Fidelity DNA Polymerase, KAPA HiFi™ HotStart ReadyMix or NEBNext® High-Fidelity 2X PCR Master Mix. Libraries were sequenced on an Illumina HiSeq® 2000. To correct for slight differences in the number of aligned reads from each library, 180 million reads were randomly extracted from each dataset, representing an average coverage of ~6X. 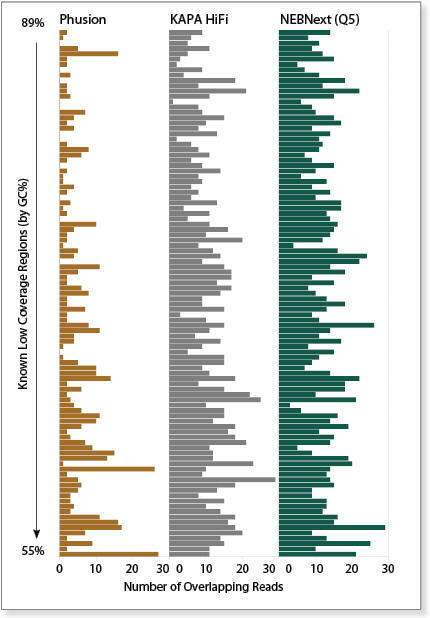 The number of reads overlapping distinct low coverage regions of the human genome (Aird et.al. Genome Biology, 2011) are shown for each library. The NEBNext High-Fidelity 2X PCR Master Mix gives the most optimal performance of the three enzymes / master mixes tested. Figure 2: Fidelity Comparisons of Different DNA Polymerases. Fidelity measurements of Taq DNA Polymerase (in Standard Taq Buffer), KAPA HiFi HotStart ReadyMix and NEBNext High-Fidelity 2X PCR Master Mix were measured side-by-side in a PCR-based mutation screening assay using a lacZ method modified from Kermekchiev et al., 2003. Values (n ≥ 2) are expressed relative to KAPA HiFi HotStart ReadyMix. 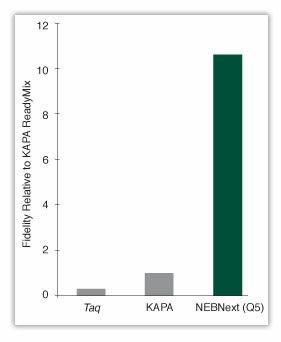 The Q5 High-Fidelity Polymerase in the NEBNext High-Fidelity 2X PCR Master Mix has a level of fidelity >10X higher than that of the polymerase in the KAPA HiFi Hot Start ReadyMix. Figure 3: Comparative Analysis of Different DNA Polymerases with Genomes of Varying % GC. Libraries of H. influenza, R. palustris or human genomic DNA were amplified using NEBNext High-Fidelity 2X PCR Master Mix, Phusion High-Fidelity PCR Master Mix with HF Buffer or KAPA HiFi HotStart PCR ReadyMix, and sequenced on an Illumina® HiSeq 2000. GC coverage plots were generated, with % GC content of 100 bp windows on the X axis. Normalized coverage is indicated by the blue circles, windows at GC% indicated by the red lines, and base quality at GC% indicated by the green line. NEBNext High-Fidelity 2X PCR Master Mix provides substantially reduced bias on all three genomic DNA samples. Figure 4: Comparative Analysis of Different DNA Polymerases at Varying GC %s. Amplified libraries of human genomic DNA were generated using index primers and NEBNext High-Fidelity 2X PCR Master Mix, Phusion® High-Fidelity PCR Master Mix with HF Buffer or KAPA HiFi HotStart ReadyMix, and sequenced on an Illumina® HiSeq™ 2000. An equal number of reads from each dataset were randomly selected and the percentage of reads was plotted against GC content. 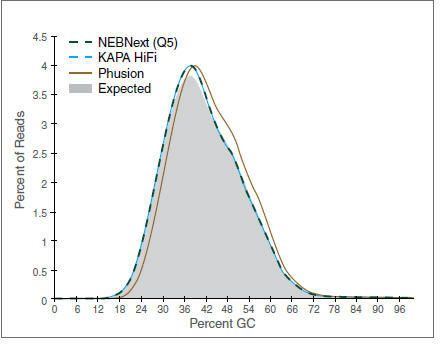 NEBNext High-Fidelity 2X PCR Master Mix and KAPA HiF HotStart ReadyMix aligned closely to the expected read frequencies (shaded grey), while Phusion did not. NEBNext High-Fidelity 2X PCR Master Mix, DNA template and 0.5 μM to 1.25 μM primers (depending on sample input) in a total reaction volume of 50 μl. To ensure optimal performance, the master mix should be thawed and resuspended prior to use. Stability testing using up to 20 freeze/thaw cycles has shown no negative effect on master mix performance. The NEBNext High-Fidelity 2X PCR Master Mix may be liquid at -20°C. How many cycles of PCR should I perform with NEBNext High-Fidelity 2X PCR Master Mix? Will NEBNext High-Fidelity 2X PCR Master Mix incorporate dUTPs? Are the DNA products produced NEBNext High-Fidelity 2X PCR Master Mix blunt-ended or do they have a single base 3’ overhang?